I had a few leftover porcelain ornament blanks from when SU used to sell them - you can order them here. Jolliest Time of the Year stamped in versamark, black embossed. Colored with watercolor crayons and aquapainter. Applied heat and stick and DD Glitter over entire ornament. Edged with a gold Krylon marker. Gold Elastic Cord added for the hanger. Image stamped in Ranger Black Archival, heat set. Colored with sharpie markers. DD Glitter added with a 2 Way Glue Pen. Ornament edged with a gold Krylon Marker. Gold Elastic Cord added for the hanger. 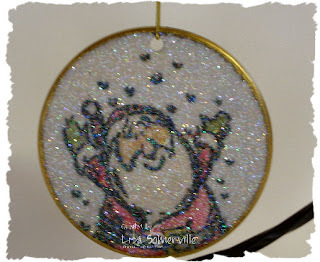 Click here to see one I did a few years back using SU's Polar Bear Stamp Set. Gorgeous as usual Lisa. And I DO have plenty of these ornaments left over! Those ornaments are STUNNING. Your tree must really sparkle, love the Thomas Kincade stampe, bought a few myself, haven't had the guts to test drive them yet! Great stuff. Oh my word Lisa! Those are gorgeous!!! Fantastic job!! 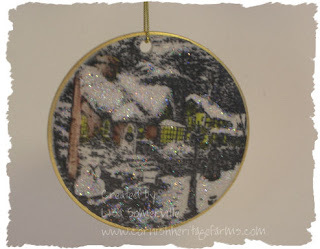 Lisa ~ How do you do it...these ornaments are gorgeous. It looks like real snow on them. Great ornaments Lisa! I wish SU! still sold them. The shipping at that other site is crazy!